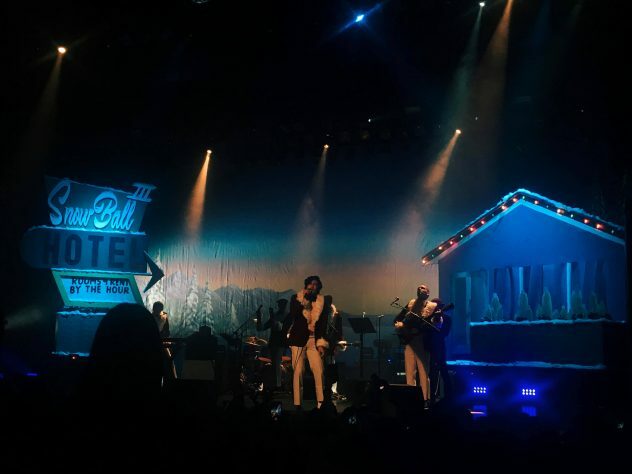 The Growlers bring their signature beach-goth style to Los Angeles’ Wiltern Theatre for two nights of Christmas-themed theatrics! It’s the second week of January. Christmas is over, and you’ve got the credit card bill and weight gain to prove it. The excitement of New Year’s Eve has disappeared, replaced with morning-after regrets and the realization that you’re making the same bad decisions as you were in 2018. All you’ve got to look forward to now is the upcoming semester of school and, if you’re me, your impending return to Canada (despite my “final” blog post last month, I’m still here!). The going is getting tough. Allow me to transport you back to a more magical time. A time full of whimsy, mischief, and light debauchery. It’s December 22nd. Christmas is approaching, you’re finished with school and work, and your best friend Mariah has just arrived in San Diego despite almost having her entire vacation cancelled the day it was supposed to begin. 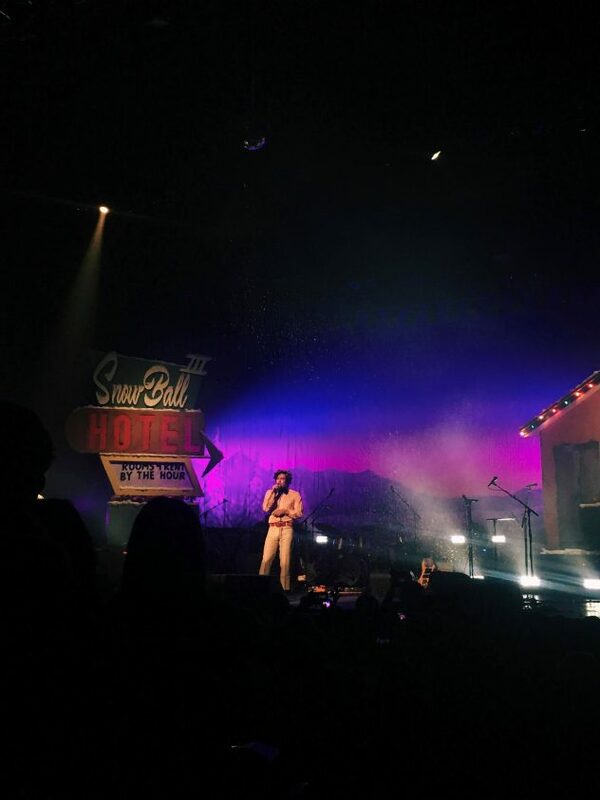 You drive to Los Angeles for what will become one of the most special concerts of your life: it’s night two of The Growlers’ Snow Ball, the self-proclaimed “beach goth” band’s third annual holiday extravaganza. The Growlers’ fanbase can come off as a little cultish sometimes, yet Mariah and I still planned to see the band for the second night of Snow Ball. When tickets went on sale, we were aghast at the roughly $60 price tag. “Who do they think they are, Beyonce?” Somehow, Saturday’s show still managed to sell out, and people were reselling tickets for upwards of $100. Despite this, we set off for Los Angeles on December 22nd with the hope that we’d end up at the show that night. After dealing with numerous people from Craigslist who we believe to have been scammers, we finally secured tickets from two people we found on The Growlers’ subreddit (pro tip for finding legit resale tickets!). Have you ever actually stopped in your tracks? I used to think that was just a phrase used in novels for hyperbolic effect: “I stepped through the doorway and stopped in my tracks.” However, upon having my ticket successfully scanned to enter The Wiltern, I stepped through the doorway and stopped in my tracks. I had not anticipated the level of production The Growlers had curated for this show. Red and white striped candy canes lined either side of the path into the main lobby. Upon closer inspection, these “candy canes” were actually joints. 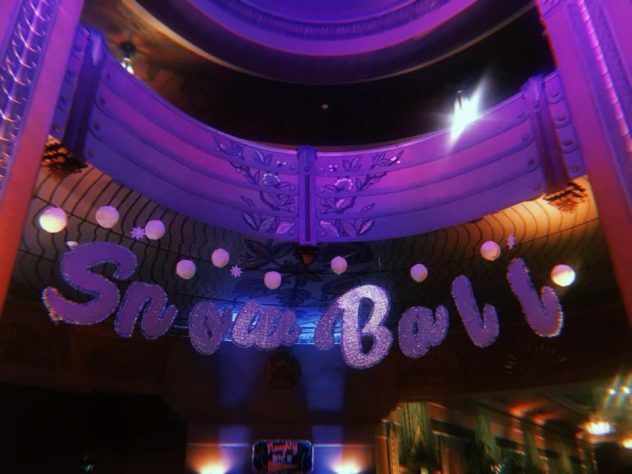 “Snow Ball” was spelled out in glittery letters suspended from the ceiling. To our right was a spot to take photos with Biker Santa, straight ahead was a spot to take photos with the Grinch. Christmas carolers covering the Growlers’ songs greeted you as you descended the stairs to explore the lower level of the venue. Decorations aside, the Wiltern is a beautiful and historic venue worthy of commendation on its own. Mariah and I immediately realized why ticket prices were so high for the Snow Ball shows and felt bad for being so ruthlessly critical of The Growlers in the weeks leading up to the show. 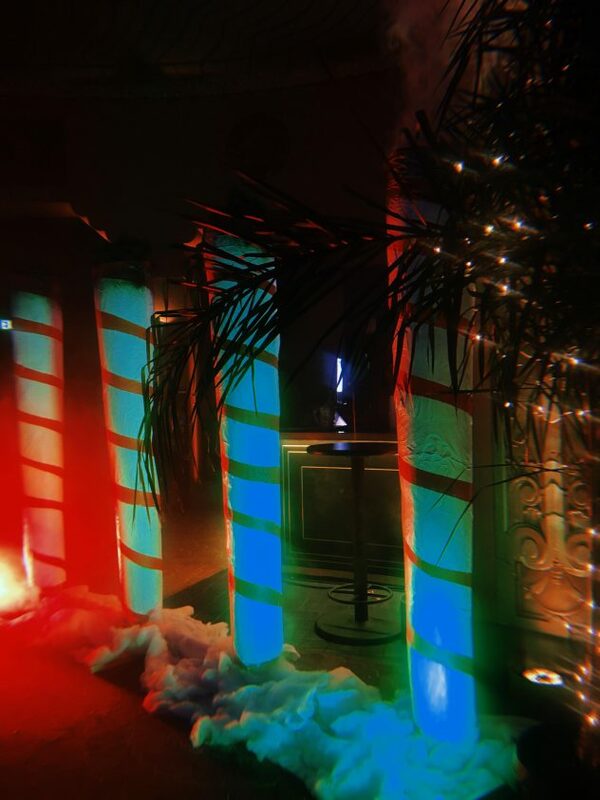 The DJs that kept us occupied before the main event were spinning straight bangers for an hour and a half – I remember hearing The Jackson 5 and reciting facts about Motown and Berry Gordy Jr. that I’d learned in Music 351 . Just after 8:30, the excitement was palpable. As the curtains rose, the aforementioned carolers took the stage. Although they didn’t play my favorites “The Daisy Chain” and “World Unglued” off of 2016’s City Club, they played just about everything else. Literally, in one show! Talk about bang for your buck. I’m surprised I didn’t burst into spontaneous tears when “Someday” started, or during “Lonely This Christmas,” as the rest of the band cleared the stage and Brooks Nielsen serenaded each and every one of us while fake snow cascaded over him. The costumes were a real treat. Like I said, The Growlers were never my favorite band. I like their music a lot, but there was just something about them that prevented me from entering obsession territory. Since Snow Ball, . Mariah and I listened to their cover of “Lonely This Christmas” on repeat (literally, we put it on repeat) for seven days. I’ve begun my descent into watching every video related to the band on YouTube. If y0ur Tinder anthem is by The Growlers, I’m swiping right. The obsession grows each day. There is only The Growlers. The Growlers closed out Snow Ball III with “Going Gets Tough” from 2014’s Chinese Fountain. It’s a song of hope and happier days to come, and also a song that gave me momentary comfort during the hellish two hours on December 20th wherein I thought Mariah’s vacation to San Diego was cancelled and I was going to be Lonely This Christmas. It was a beautiful and pure send off after a dreamlike, awe-inspiring night. Post-Growlers, the opening notes of Mariah Carey’s “All I Want For Christmas Is You” (naturally) rang out. Mariah (not Carey) and I grabbed each other’s hands, I kicked off my shoes for some reason, and a holiday dance party and sing-a-long ensued. The only snow I ever want to see is fake snow floating down onto Brooks Nielsen’s head. Andrea Renney loves crying to The Growlers, writing for KCR, and crying about not writing for KCR anymore. She wishes everyone at San Diego State a beautiful spring semester. --From all of us at KCR, we'll miss you Andrea! Hey Aztecs! Here on Now Listening with Lala I am very pleased to announce that The Growlers have finally released their new album, City Club. I have been patiently awaiting new music from this Southern California band, and am very excited to break it down for you. The Growlers are typically known for the coined term “Beach Goth”, which is also a music festival that is happening this October in Orange County. Now, this particular band combines garage rock with elements of surf, folk, and a bit of a rockabilly 60’s vibe. Their unique sound is what has given them such popularity in the last few years. City Club, however, strays from the typical country rock that we’ve seen from The Growlers in the past. Produced by Julian Casablancas and Shawn Everett, this album contains a much more synth funk and retro vibe. Pulling elements from the disco era, the tracks on this album have a more electro pop sound than previous albums from The Growlers. Not that different is any bad, City Club is side stepping into a direction that the band has not dipped their toes into yet. This album is still fantastic overall, but it just might take a few listens to warm up to the tracks. A few popular and favorite tracks on the album so far include the first track, City Club. Upbeat and very dancey, this track still maintains that Growler’s attitude, full of reverb, just less synth. In addition, World Unglued is a very good track. Reminding me most similarly to The Growler’s previously folky sound, this particular track talks about just letting go of the world around you and setting yourself free. Swanky and eclectic, The Growler’s really nailed it with this song.